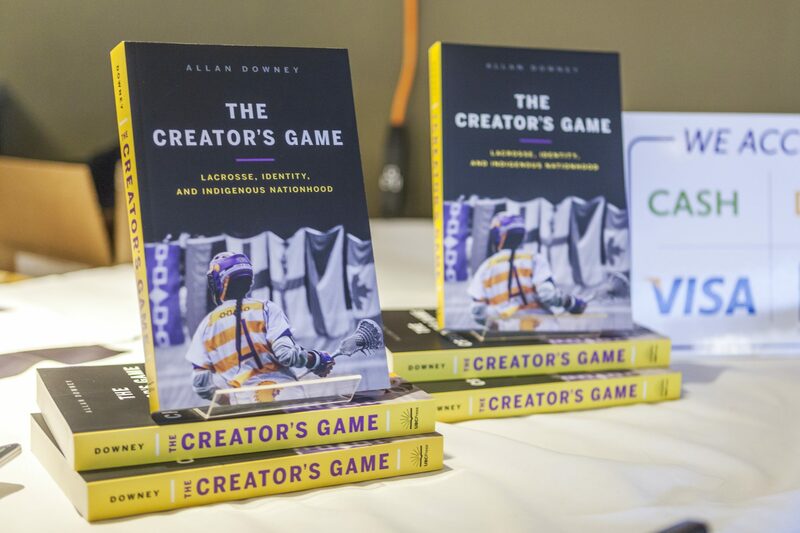 On April 3, former Wilfrid Laurier University graduate student Allan Downey came back to campus for the launch party of his new book, The Creator’s Game. Hosted at Veritas Café, the launch party brought out Laurier students and faculty to hear Downey speak about the book, a history of the game of lacrosse and exploration of its position in Indigenous societies. “Ultimately, lacrosse has been a big part of my life since I was 10-years-old,” Allan Downey, former Laurier graduate student and current assistant professor in the department of history at McGill University, said. “I had these two passions, history and lacrosse, as I was growing up. I ended up going on a lacrosse scholarship down to the US for my undergrad,” Downey said. “And then I just had the opportunity to come back and do graduate work here at Laurier, and what I ended up doing is combining my two interests—history and lacrosse—and started writing a history of lacrosse in my master’s here, and the next year, started that as a PhD project,” Downey said. And during that time, Downey published extensively on the topic of sport in Indigenous society. This work caught the attention of Sara Margaret, Laurier master’s student and organizer for the book launch at Laurier. Downey, whose connection to the game of lacrosse has guided the direction of his life, sees the game as a lens through which we can view the history of Indigenous societies. “My main research is on Indigenous sport,” Margaret said. “And so when looking through a lot of the work, a lot of the stuff that I found was Allan’s work, because a lot of his stuff is really similar to what I wanted to write about,” Margaret said. Working with the Indigenous Student Centre as the SAGE (Support Aboriginal Graduate Enhancement) Laurier coordinator, Margaret found out that Downey was interested in launching The Creator’s Game, the culmination of this work, at Laurier. “He really wanted that, so I kind of took that on as part of my program, as a Laurier alumni, as an Indigenous student, to kind of present that to other graduate students, Indigenous graduate students here at Laurier,” Margaret said. “It was a really good opportunity to be like, hey, this is what you can do, and not a lot of people see that as an option,” Margaret said. “The story behind lacrosse, it’s this incredible story where Indigenous communities have actually—it’s an Indigenous game—Indigenous communities have been using this sport to actually articulate their sovereignty and self-determination for hundreds of years,” Downey said.